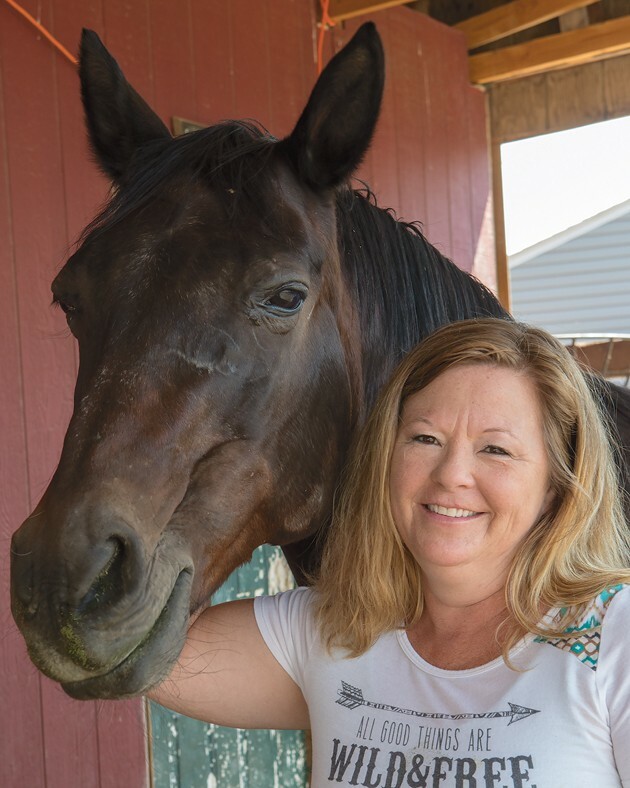 Bobbie Grover’s love of horses and animals extends from Grantsville to the West Desert. 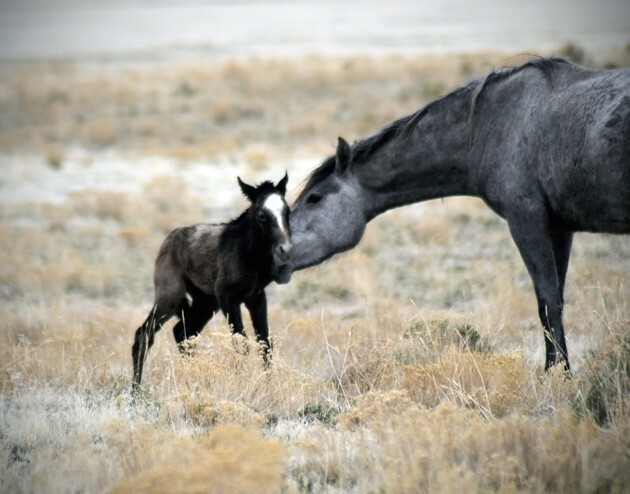 Bobbie Grover said she was blessed to witness the birth of a foal while shooting photographs of wild horses. She said witnessing the birth was an amazing experience. Two stallions were having a difference of opinion. Bobbie Grover said both horses survived the battle. 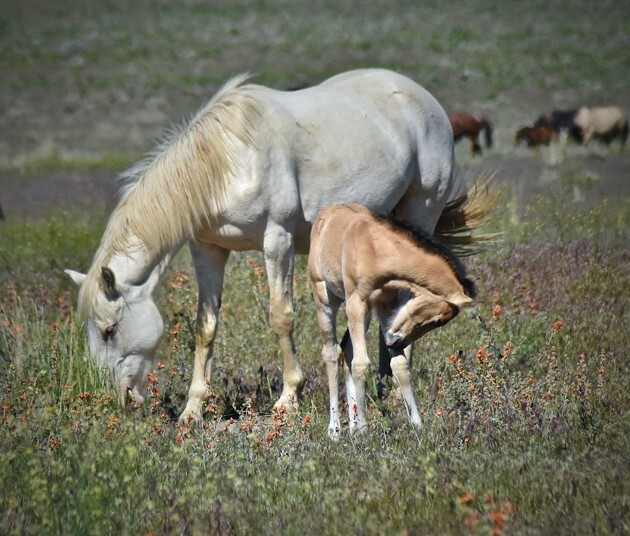 A cream-colored horse or cremelo horse grazes next to her first filly last year. 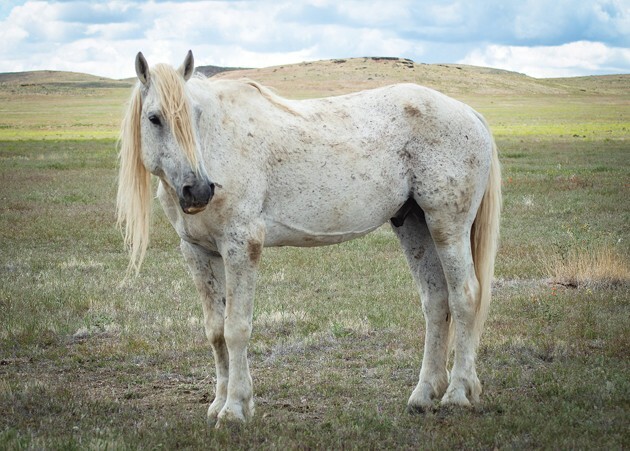 An old horse is estimated to be 25-30 years old. Grover said old horses could be in extreme danger and may not live through a planned roundup this fall. 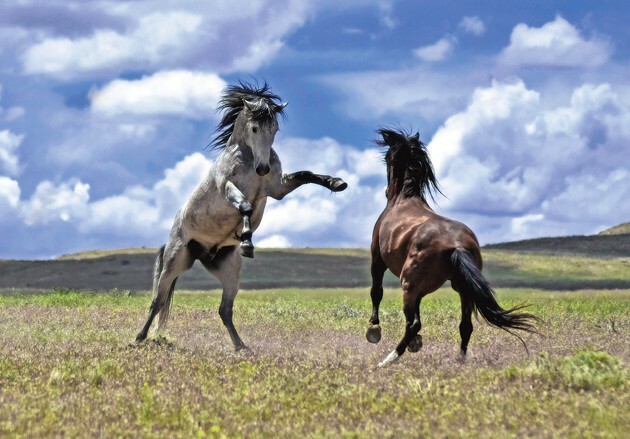 Two young bachelor stallions playfully frolic together out on the West Desert. A young bachelor sometimes gets kicked out of its family band around the age of 2-3. They are not strong enough to fight for mares so they form their own bands called bachelor bands. 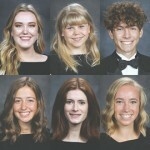 Bobbie Grover always loved horses while growing up in Tremonton, Utah, but after moving to Grantsville two years ago, wild horses in Tooele County’s West Desert have become her obsession. In the last year of studying the herd, she has uncovered a knack for both finding and photographing them. She remembered it was a Sunday. Grover cried at the sight of the horses. “It was the most beautiful thing I had seen in life,” she said. While growing up in Northern Utah, Grover thought that Utah canyons were the most beautiful areas in the world. But after discovering the county’s West Desert outback, she changed her mind. “Going out in the desert here, I had to change my way of thinking,” she said. 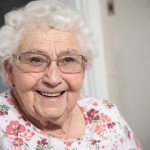 Grover said she was married for 12 years while living in Tremonton, and then, “not married for 20.” She has three kids, with three grandkids and one more on the way. When she sold her home in 2016, the plan was for Grover to move in with her daughter and son-in-law and their two children. She was working, but wanted a place to stay while she organized her life. 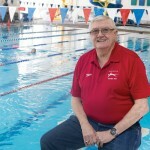 “It worked out so well with me helping out with the grandkids, that when they decided to move to this area, they asked if I wanted to come with them. And I did,” Grover said. It was a good move for everyone. And once she found the wild horses, Grover found a new hobby roaming the county’s dirt roads. One of the friends Grover met was Lynne Pomeranz, who teaches hands-on workshops specializing in wild horse photography. With Grover’s skills at finding the herds, it was a perfect match. 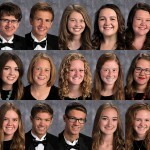 “I have only been out one time [where I came] back without seeing them,” she said. Grover has developed patience while watching and learning about the herd, which contains a larger group, and then bands of smaller groups within the herd. “If I listen, then I can find the horses,” she said. When Grover was growing up, she liked to keep pictures of wild horses on her walls, but she didn’t know Utah actually had wild herds. Grover said she has learned so much just sitting and watching. Grover also enjoys helping Pomeranz when he hosts his photography workshops. Many times she will go out in her 2006 Chevy Silverado to help scout out where the horses are hiding. “I go and do a pretty good job of finding them when they don’t want to be seen,” she said. Grover attributes her success to her love and knowledge of two main herds in the Tooele County’s West Desert. But, of the two, the north herd is her favorite. In each band, there is a head stallion and a lead mare. In addition, there are other female horses, the mares and their offspring. Grover has even found a yellow horse that got his ear bit off. Throughout the past year, Grover has followed the horses and their patterns. Grover has gained a reputation for finding the herds, but when it comes to guiding people, she keeps it low-key. People usually just message her to express interest in seeing the horses. “I go, and they photograph and I explain what I have learned,” she said. What lies ahead for Grover? This Sept. 10-12, Pomeranz is doing a workshop and she is planning on leading some of the groups. Grover calls Pomeranz her mentor for both learning about the horses and photography, but she also states that he has become a good friend. In addition to learning about the animals and to photograph the herds, Grover feels she now has a duty to do even more on behalf of the horses. “There is a reason I am here, where I am at right now and I believe it is to get something going to protect these horses,” she said. Grover’s next goal is to establish an advocacy group that can help protect the wild horses. 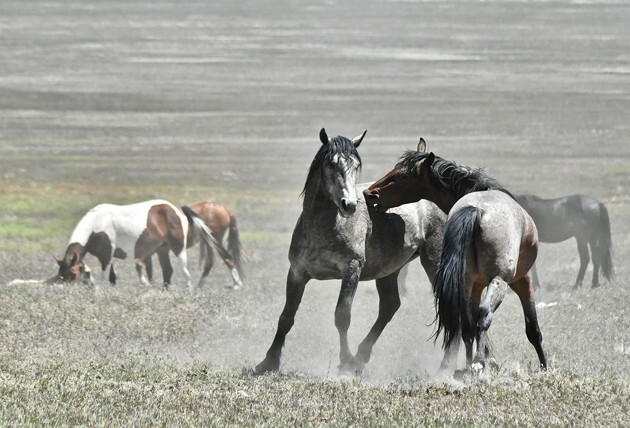 Federal and state agencies are planning a wild horse roundup this fall, she said. They plan to remove 359 horses from the area and leave 112. Perhaps Grover’s desire to help proactively manage the herds was born out of an experience she had with a deserted foal. She was out in the desert when her group came across the horse. When she went back out the next day, he was with another band. But on the second day he wasn’t with them. As she drove around, she heard a faint ‘neigh.’ He was stuck in the mud. She called the Bureau of Land Management and waited for the band of horses to return to get him. But they never came. That night the BLM called Grover and said she could take him home. Her group loaded him up and Grover rode in the truck’s bed with the foal. Later, Grover said, she and a group of women from California saw a mare prepare for birth. They watched the miracle of life unfold in the desert. Grover said she recently won a photo contest with ABC4Utah with one of her two photo submissions. She is also learning Photoshop to fine-tune her photography so she can eventually sell prints. Grover said she often thinks about growing up, with her bedroom walls covered with wild horse pictures. She remembers how she and her dad would talk about going to see the wild herds. Now that he is gone, she said she feels like her father is helping her find the horses they once dreamt of seeing together. Whether she is out in the desert alone, or leading a group on a guided tour, Grover is simply experiencing or helping others to see and feel an area she loves. She also shares what she has learned and shows others the beauty of both the desert and the wild herds. Grover has found her home in Grantsville, where she is content after finding wild horses she dreamt about so many years ago as a child. Those horses now aren’t far away. Grover’s photos of wild horses can be found on Instagram at username “bagrover” or on Facebook.